Carousel are a 6-piece Americana music collective, based in Southend-on-Sea. 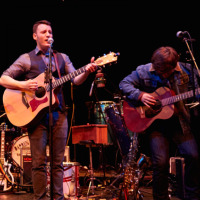 Discovering inspiration and enthusiasm in a plethora of music, the band fuse country, folk, rock’n’roll, blues and roots music into their own stylings, whilst taking full advantage of having 4 vocalists at their disposal. Do you promote/manage Carousel? Login to our free Promotion Centre to update these details.